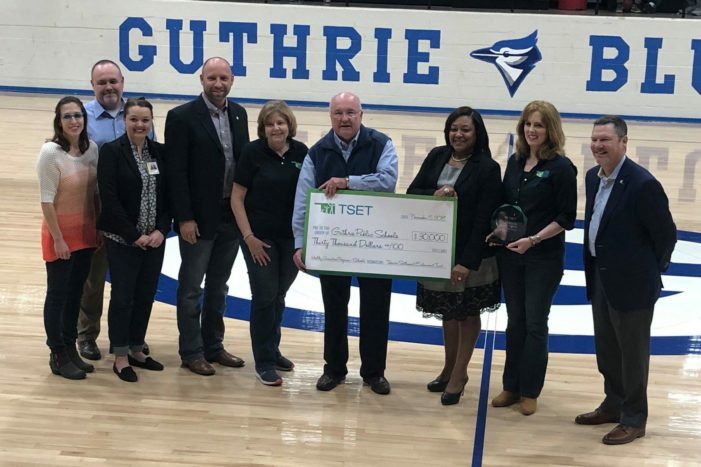 Guthrie Public Schools was awarded a $30,000 grant from TSET for promoting healthy living. The presentation came at halftime of the Lady Jays basketball game on Friday night. The grant will go toward additional playground improvements at Charter Oak Elementary School. TSET officials presented the check to Superintendent Dr. Mike Simpson, Chief Financial Officer Michelle Chapple and Principal Jeff Ball. Others participating in the ceremony were members of the GPS legislative delegation, Rep. Garry Mize and Senator Chuck Hall along with Logan County Heath Department staff members Courtney McLemore and Carissa Redman. Securing this grant allows other school sites within the district to apply for future grants.